Hi Everyone!!! ... hru all doing today??? All good I hope! Well, it's been such a long time Love didn't make any special drinks! I always wanted to do it...but the laziness in me never allowed it...hahaha! But, today...Love buat jugak Mango Lassi! 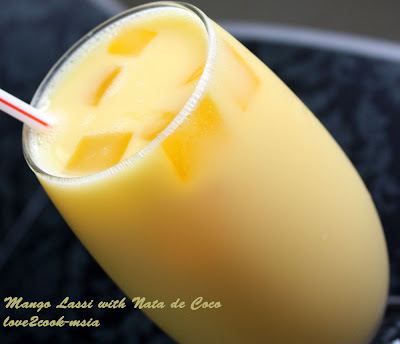 Pour into a glass, add some cubes of mango flavoured Nata de Coco! Chill urselves! Worait, layanz the drink pics today! Wanna join Love??? love...kak ain nak gak manggo lassi tu. tekak mmg tengah haus ni. looks so refreshing!!! Hi Lady, I was at Watierman's place noticed your callsign, 'Love to cook'....so I busybody over see whats cooking? Wow! 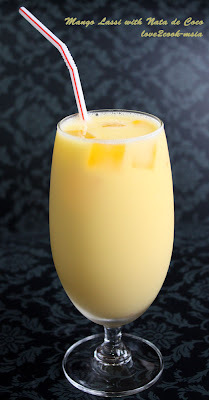 Mango lassi? This I have not tried yet. Ada lagi ke? Looks very refreshing. Here's wishing you the best of Season's greetings, Lee. wahhh fav drinK ni...manggo lassi! 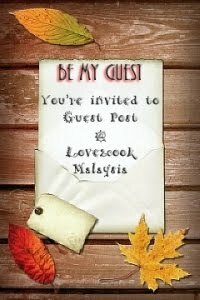 !..nak 1jug hehe..
Uncle Lee ~~> Hi Uncle Lee..this ur second visit to my blog! Welcome again! 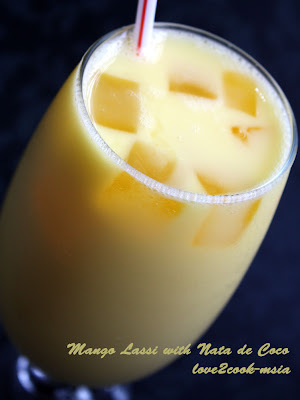 Owh, U should try Mango Lassi, sure U'll like it! Can i know how much the quantity ratio for the manggo lassi?